Duchess Kate: Princess Charlotte's Birth Certificate, the Queen Visits KP & Claudia Bradby Discount Code! Princess Charlotte's Birth Certificate, the Queen Visits KP & Claudia Bradby Discount Code! We're back with a brief post concerning updates on Princess Charlotte. Firstly, the Duke and Duchess of Cambridge have formally registered the birth of their daughter. 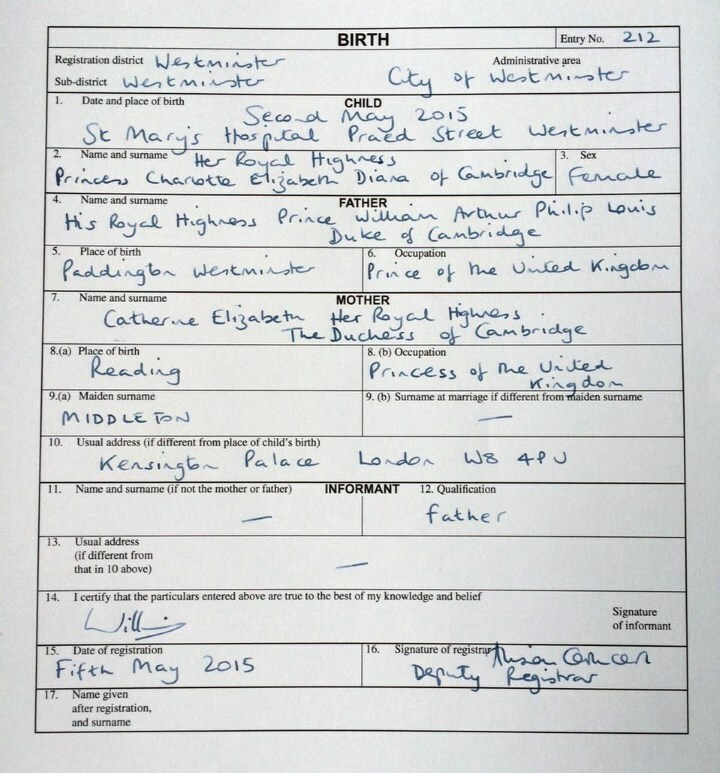 As with Prince George's birth in 2013, Prince William signed the birth register at Kensington Palace witnessed by a registrar from Westminster Register Office. Once again, Kate's occupation was listed as 'Princess of the United Kingdom'. Kate is rarely described as a princess; though she uses the title Duchess of Cambridge, she is also Princess William of Wales. 'Kate has rarely described herself as a princess, preferring to use the title Duchess of Cambridge, which was conferred on her by the Queen on her wedding day. But she is also Princess William of Wales, entitling her to be described as 'Princess of the United Kingdom'. Princess Charlotte, who was born on Saturday, is now fourth-in-line to the throne. 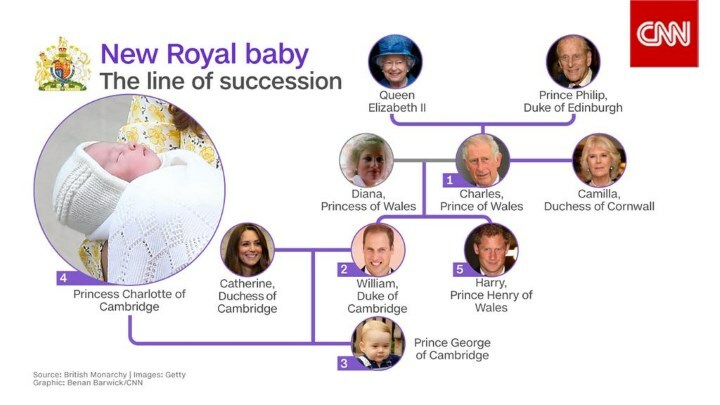 Below we see a graphic outlining the line of succession shared by CNN. The announcement of the princess's name yesterday generated a hugely positive response. It was very much felt William and Kate's choices hit all the right notes, honouring family members (particularly Diana). The story has been quite something in terms of publicity. 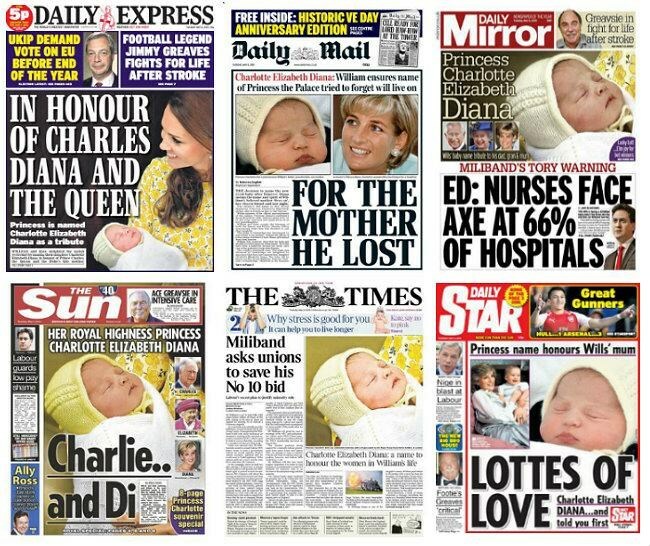 The excellent British Royals compiled a look at today's papers. 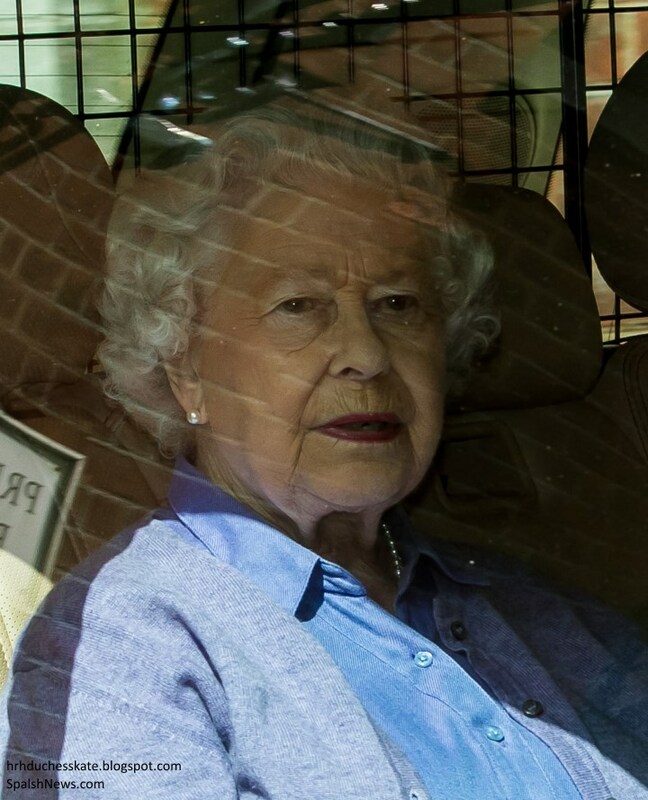 Today, Her Majesty the Queen travelled to Kensington Palace to meet her three-day-old great-granddaughter. Charlotte is Her Majesty's fifth great-grandchild and her fourth great-grannddauhter. The monarch returned from Sandringham today and spent half an hour at KP before returning to Buckingham Palace. Prince Charles paid another visit to see his granddaughter today. 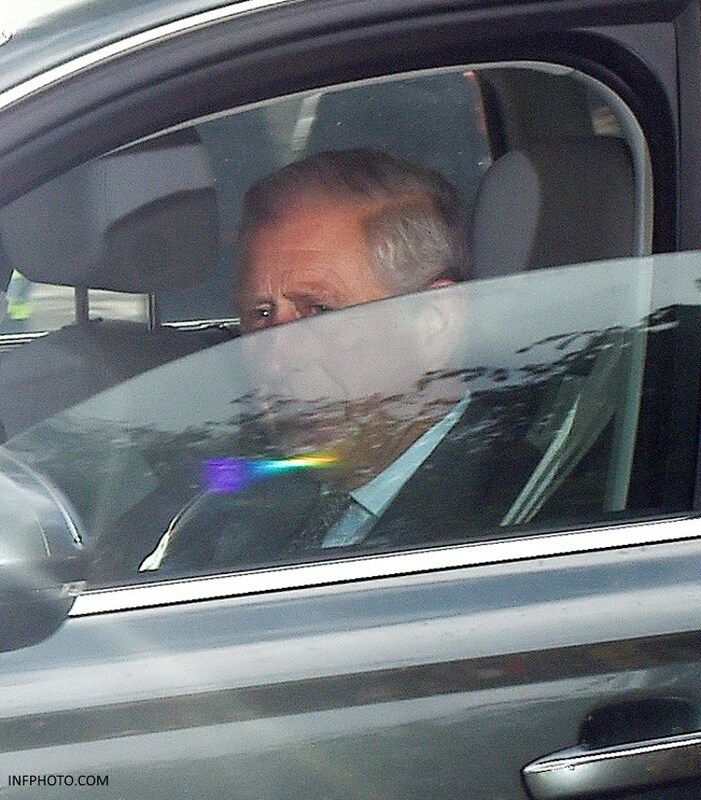 The Prince was photographed upon arrival. 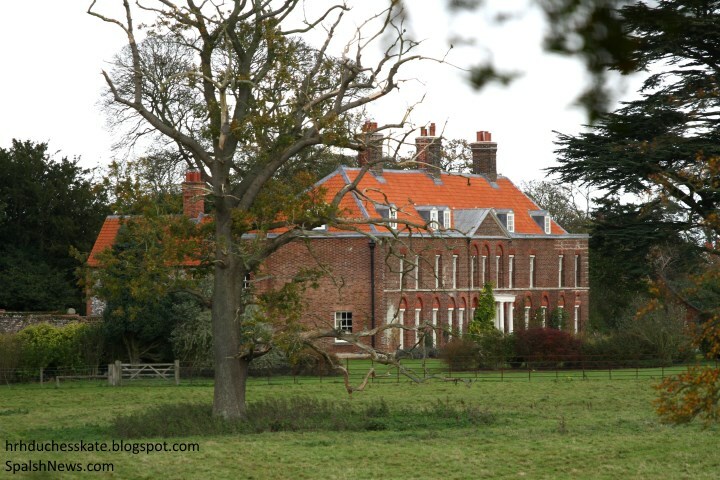 It is very much thought the Cambridges will travel to their country home Anmer Hall in Norfolk shortly. They will spend much of the next few years there, with William working as an air ambulance pilot and hope to enjoy privacy with the children. We're not expecting the Duchess to undertake engagements over the summer, although she is expected to attend Trooping the Colour next month. It is understood the Middletons will join William and Kate at Anmer, and Carole in particular will be an invaluable help during Baby Charlotte's first weeks. Next, we have something fun for jewellery lovers. Our friends at Claudia Bradby are kindly offering readers a 15% discount off purchases on their site to celebrate the arrival of Princess Charlotte. To commemorate the joyous event Claudia has designed special pieces to mark the event. The collection features elegant pieces which are very wearable for day or night. They're also a fantastic gift for royal fans and those who wish to have a commemorative item. 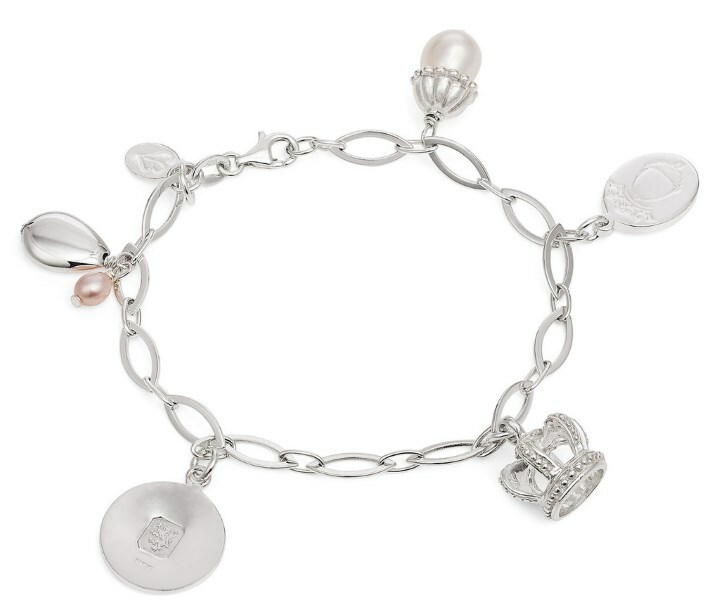 Below we look at The Royal Charm Bracelet celebrating a host of unforgettable royal moments, with the new crown and acorn charm commemorating the birth of Princess Charlotte joining the Diamond Jubilee, Pearl Acorn, Royal Crown and Silver Bean charms. 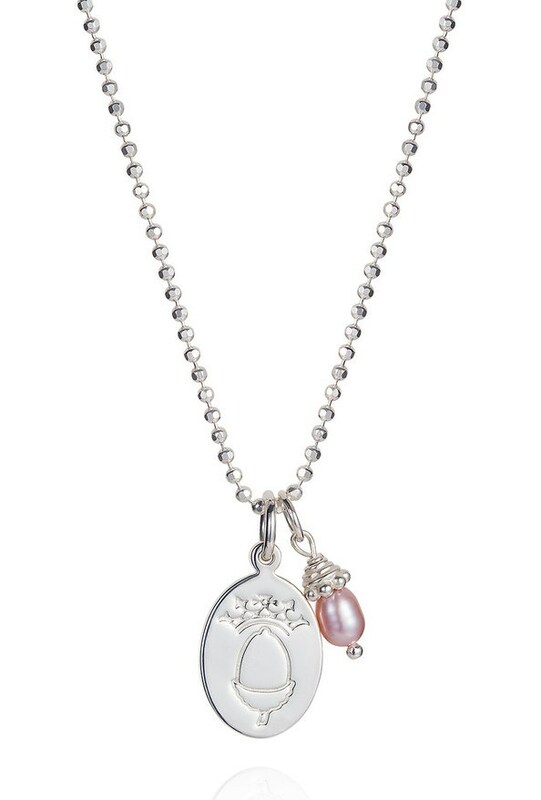 The Princess Charlotte Pendant is a striking piece with a hand stamped acorn and crown icon on a sterling silver oval pendant. The commemorative acorn and crown icon was exclusively designed by Claudia to combine the Middleton family crest with the Cambridge crown. 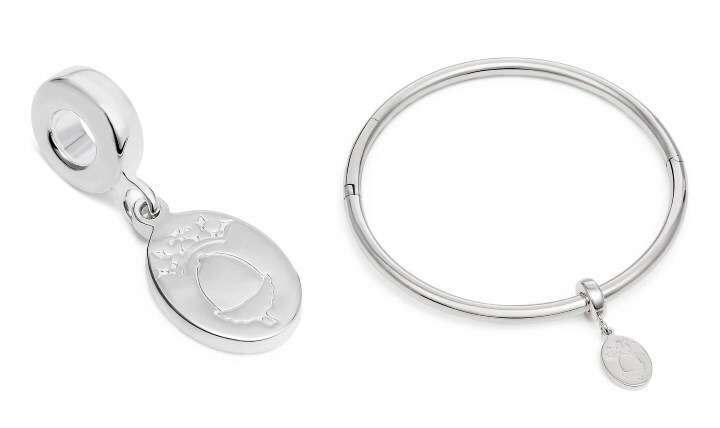 Below we look at the Princess Charlotte Charm and the chic Princess Charlotte Bangle. 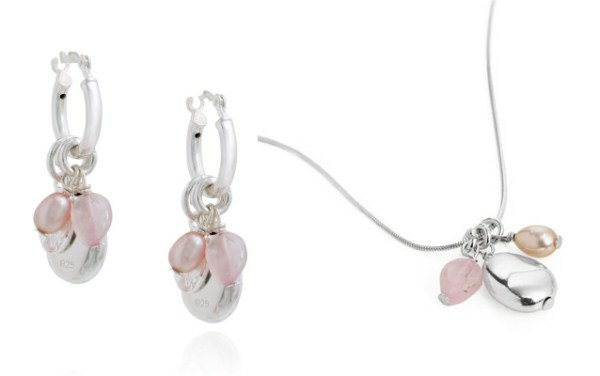 The pieces Kate designed with Claudia are still available: the Kate Silver and Rose Quartz Earrings and the matching necklace. The hugely popular Camellia Necklace is also still available. Claudia specialises in pearls and if you're after a great pair of affordable pearl earrings, there are several excellent options available. 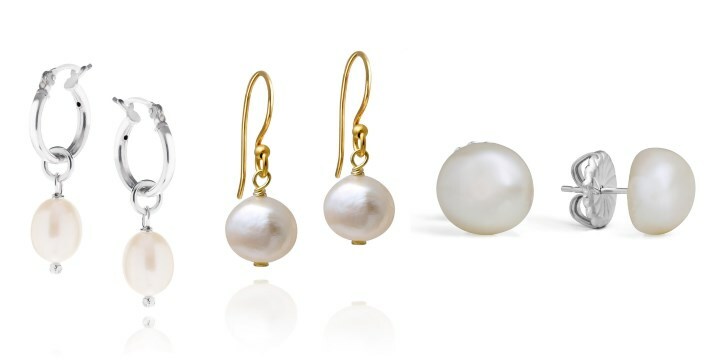 The Alexandra Pearl Earrings, Everyday Pearl Drop Earrings and the Audrey Pearl Studs are among the most popular pearls. The 15% discount code is valid until 20 May and to use it simply enter HRHKATE at the checkout. With thanks to Claudia and Hannah! 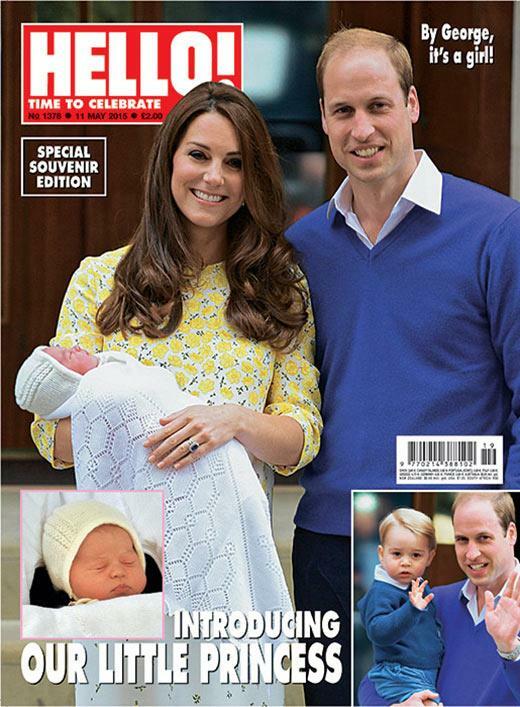 We leave you with a look at one of the many covers the Cambridges are gracing this week. We expect photos may very well emerge of the Cambridges if they leave London today, we'll add them to the post if they become available. Hopefully some pictures for George's 2nd birthday in July, if not some sooner! The Queen is the Queen. Her family does have to bow to her in many various situations. That is standard. After the bow though things seem to be family time as usual. In the videos I have seen and books I have read she seems to be a very warm and very funny lady and also very intelligent and highly educated. If she was like her official decorum all the time that would be impossible number one and very unhealthful to even try to maintain on any personal level. I think that Queen Elizabeth having had her mother by her side all those years helped her to remain herself and have the strength to do what she does and has done for years. I think Prince Phillip also contributed to this as she has said more than once. I think she is probably really a lot of fun to be around. If she were a stern person all the time she and William wouldn't be as close as they are. Charlotte, is the address on the birth certificate also the mailing address to send a card to William and Kate? Or is their a different address I should send the card to? I'm really looking forward for a pic of the happy foursome, dog included. Yes, I would love to see that too! He seems like quite a determined little boy. I hope Lupo has found some very good hiding places for those rest times he most likely needs from time to time. Interesting that Charles made another visit to KP. Perhaps some pictures in the offing with the Queen, William & Charlotte? Or just some quality time before the Cambridges head off to Anmer. I am so thankful that Charles has his son happily married to a woman that he himself likes, loves and respects and now also has two beautiful grandchildren to adore and spend time with and one them is the little girl he has wanted for years. stuff that had happened. What a humbling experience that must have been. Now, after clearing the slate between God and the nations, he gets this little special blessing called Charlotte. I am so happy for him. When did Charles & Camilla repent, & how do we know they repented. I don’t recall a statement being released, & I am not able to read minds. Even if they repented, the damage was done, in that Charles & Camilla were dating during Charles & Diana’s dating period, during their engagement, as well as their marriage. On the tapes of Diana, she stated confronting Camilla & Charles at Camilla’s sister’s b-day party. Princess Diana asked Camilla to bow out, but Camilla refused, saying Diana had her boys, charities & everything she wanted. Diana’s reply was that she wanted her husband. Charles was led around by the nose by this woman. He made Diana’s life hell for not giving him a daughter. The very day he saw Prince Harry in the hospital, he complained that Harry wasn’t a girl, had ginger hair. Charles left for the polo field while Diana cried her eyes out believing that her marriage was over. Once Diana was kicked out of the firm, stripped of her HRH & died, even the laws were changed so that Charles could marry the woman he loved versus having to abdicate & move to the Bahamas as his uncle did. Those boys know the truth. That’s why Catherine where’s their mother’s ring, & that’s why the new princess has been named Charlotte Elizabeth Diana. Princess Charlotte will be able to reproduce, so the name Diana will live on & on. I've been wondering whether the Queen originally planned to visit Princess Charlotte at Sandringham, since she spent the weekend there at Wood Farm. If so, Kate and William must have decided to remain longer in London than they had intended, perhaps to let Charlotte settle in and Kate recover. Kate may also have wanted to stay in contact with her midwife. They would also need to register the birth and as Monday was a bank holiday yesterday was the first opportunity. Obviously when they do go to Norfolk,they will be there for the summer and the registration has to take place within 42 days. Thanks for the explanation, Jean. So nice that we've had you there to give us immediate news of birth, gender, name, and bank holidays! I remember William had to return to London from Bucklebury to register George's birth. But did he keep the Queen waiting so he wouldn't have to make another return trip to register Charlotte's? It's so nice to see how loved this little girl already is. Grandpa Charles I think will be wrapped around her finger. Not that he doesn't love George but this little one I think will hold a very special place in his heart. Yes, it is. He always did want a daughter & he seems already smitten with his granddaughter. I was so surprised that he made a second visit so soon. how sweet. and Michael wrapped around her little finger also. I expect he went to see both children before they go off to Norfolk. Is the name Charlotte a feminine version of Charles? is the press right about it being a nod to Prince Charles? or is a stretch to assume that? I think they liked the name and it was a bonus that it's the female version of grandpa Charles which lets them honor the Dukes beloved father. googling 'meaning of Charlotte' or 'Charlotte', all of the baby name websites and several of the online dictionaries all say it is a derivative of "Charles"
purpose. Also, when singing God Save The Queen, Michael Middleton does so with gusto. You could be right about Carole's middle name but I don't think Pippa was named after Philip and Charles. I think Carole and her husband probably just like traditional names. There's no connection between Catherine or James and any of the members of the Royal family around the time they were born (as far as I know). According to Carole's brother, "Uncle Gary", his and Carole's parents were very much monarchists. The name Elizabeth had been popular for as long as remembered in England, and other countries of its affiliates, a popular as well as Old and New testament name. Carole herself might have inherited the name from her own previous generations. Charlotte's name seems to identify the person who wished for her for a long time, coinciding with the female version of her grandfather, Prince Charles. Where and how Elizabeth found itself in the middle of the name arrangement is strikingly interesting. Although honoring the sequence, hierarchy and endearment of the current queen, the Queen Mother, Elizabeth had played the main role of bringing the marriage of C and D into existence ( according to repeatedly reminder stories and movie of the past). Philipa from what I heard means lover of horses. Some day down the line, I can imagine some young lady of W&K 's grand kids, making an oath of marriage at a wedding, " I Elizabeth Catherine Diana Charlotte..." as was, "I Catherine Elizabeth.."
James Middleton's middle name is William. He was born in 1987, five years after Prince William. What was Michael Middleton's father's role when he was with Prince Philip? co-pilot/navigator I think. They flew a substantial number of hours together. Lovely reply anon 15. As a well watcher outside St. Mary’s said, the good thing about having a princess is that she can reproduce. I loved seeing the graphic of the line of succession in pictorial form and the Claudia Bradbury jewellery is so pretty. 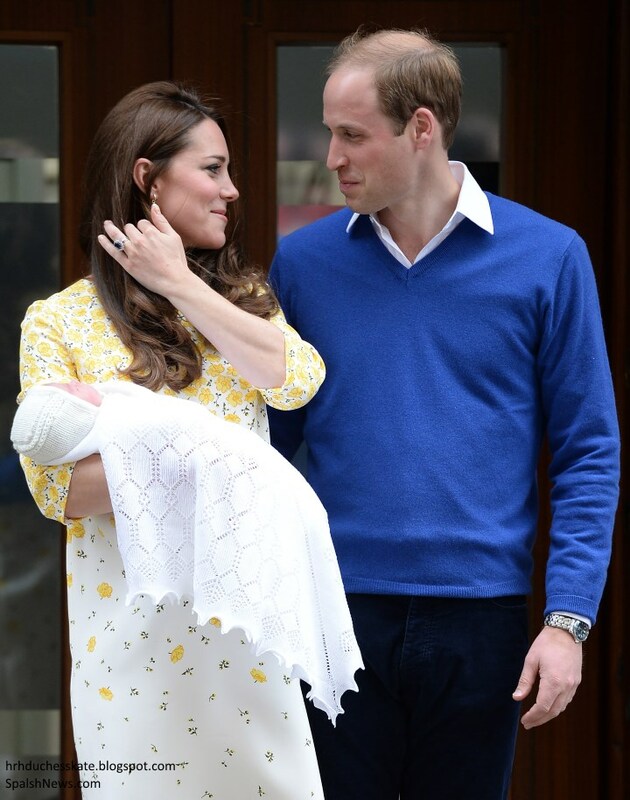 Little Princess Charlotte has such a feminine face, and I think it looks like she has William's nose. Does anyone else think so? While she is too young to really say, I think she will have her own distinctive looks and will no doubt be a beautiful child just like George is. I'm so pleased they decided to take George to the hospital as he so rarely appears in public. What a gorgeous family they are, and I hope they have some quiet time at Anmer while little Charlotte settles in to a routine. Thanks for the great post! Yes, I do see William's nose. With George it was more obvious, but I do see a hint of it. The Queen looks wonderful and I'm glad Charles enjoyed another visit. Do you think pictures of the inside of their homes will ever be made public? Probably unlikely, for both privacy and security reasons. As much as I love, love, love decor and design, I am surprised that I do not want them to photograph or video or tour their private dwellings for us. Not in this day & age. In Diana & Charles’ time, there were a few pictures of the boys when they were very young. I remember a photo op with Diana & William, as well as one with William & Harry playing piano. Things are different now, & security must be considered. Hmmm I'm thinking that jewelry is pretty nice too! Should I? Wonderful coverage as always Charlotte! I think it's wonderful that Prince Charles has been by to see the Princess multiple times. I'm sure he is a very proud grandfather and wants to get in as much time as possible before they move to Anmer Hall and his own schedule fills up again. I do hope we get a first family photo like the one Mr. Middleton took to introduce Prince George to the world. They looked so happy, relaxed and comfortable, it was quite a treat. I also hope that maybe one day we'll see some photos of Prince Harry with his niece and nephew in a fun and relaxed setting. I think he will be a great source of fun and would love some glimpses into that side of their lives. I'm curious if he'll be included as one of the Princess's godparents - I'm not familiar with the purpose or choosing of multiple godparents. I'm one of 2 godmothers and a godfather to my nephew but that was my sister's preference. Any insight? affect the monarchy in so many ways in the years to come will be very significant don't cha think? I think the jewelry is absolutely beautiful, and I absolutely love all the ways they have incorporated both families! Where I live, we happen to have many Oak Trees, so the acorn is special to me as well as all that the Oak Tree symbolizes. Having said that: I just can't wear jewelry for someone else's child. My body only wears one child's name and that is Reece. My child. I wonder what the Queen and Prince Charles think going through that gate after a span of time and in such occasion. The memory of that sea of flowers in 1997 as a symbol of love, care and farewell from the public as if back as spring bloom in a birth of a child named for all the major people of the story. Each of them gets their names in William’s child including fans and followers of the three people. One plus about monarchy is the sense of tradition, continuity and stability. It does come with a prize, but the worst is if it is the kind that is negligent of its own people, divisive, corrupted, gloated etc. Britain had been lucky to keep some balance, but the old class system seems markedly still there. If it was absolute monarchy, in this day and age, it would not have lasted. Diana’s shake up of matters was somewhat a welcome rebellion for her own generation. Each generation has a way of refreshingly updating the previous one. You were thoughtful posting an up dated version of Michael Middleton’s picture smiling leaving KP after he saw his granddaughter (in the previous blog). There was some complaint about his serious look of his entry to KP. As far as names, he is connected to his granddaughter through the names of his only two daughters. There is something about simple jewelries that is a must to keep and especially when they have meaning. The Oak tree has symbolic meaning in some cultures as a shelter, shade, continuity and permanence. The acorn is used for Christmas decorations for some people. Claudia’s husband did an excellent job of W&K engagement in 2010. I love your posts--so thoughtful. You echo what I said in a post on a few days ago which said in part--adversity is an opportunity for us to grow and the BRF has had it's share and so the generation that is Will and Harry have learned from that adversity and have helped to continue to change the face of the monarchy. It began with their Mon and Dad and we are seeing the lessons learned put into action which is a beautiful thing. We see the pure joy on the faces of William and Kate especially with the birth of Princess Charlotte and I am impressed that they acknowledge the adulation, adoration and genuine interests of royal fans and watchers everywhere. Thank you very much. It is kind of you. I agree adversity is an opportunity for change and growth. During its trial and challenge, it can have some degrees of pain and confusion. In some cases the scar can linger on. Lucky are those who have the guidance to overcome it into a positive change and even victory. In their status of privilege, money and family can be helpful, but the result may not necessarily be predictable all the time. William along with his wife are good role models for their generation. Harry is impressive with his undertaking of the wounded veterans. Over all, they turned out neither spoiled, partial to their parents’ divorce, nor rebellious in the wrong way of abandonment and denouncing of everything they were handed (the good and bad). I have always wondered if William (he knows it or not, beyond liking flying helicopters) chose a career in rescuing those in danger from the experience of his mother’s accident and the delayed help). As far as love and family, he had honored his mother's advise, " if you love some one, and you are lucky enough they love you back, protect it". He was more than lucky not only in finding mutual love, but also knowing what and who he wanted in spite of some odds of his friends comments during his courtship. Anon 15, you are deeply right with your suggestion about a possible root for the kind of work chosen by William. Thank you for your beautiful posts. As for me, I could go on and on about adversity etc; however; not wanting to "hog" the space and give Ms. Charlotte too much to read before she approves our post, I will just say that I concur. I doubt whether your are far off in thinking that William's caring nature is innate. Wasn't he the one who would push tissue paper under the door of the bathroom to his Mom when she would be upset and crying; He also wanted to be a police officer as he wanted to protect her? Of course that is all "hearsay' but we can see his caring nature play out quite frequently in public when he is with Catherine--the hand on the elbow; on the small of her back. So to your point, he cares deeply about others. And yes, he honors his mother and father which is most honorable and a blessing. I personally, won't read anything into what his friends may or may not have said about his wife when they were dating. He seems to be the type of person who knows what he wants and is determined to go after it and frankly is not influenced by peripheral opponents, beside he has a great support system in his Dad and Grandmother with all her wisdom and experience and he added to it when he married Catherine. You are very welcome. I am glad someone else thinks the same way regarding William's career choice. I think it is either after the concert for their mother in observance of her ten years departure (Summer 2007), or just their visit to USA, they were interviewed on NBC by Matt. He asked them what they would have wanted to be if they were royals or not. I remember William answering; I want to be a helicopter pilot. Matt asked him in what capacity? William answered, may be for UN ... Matt asked him, you mean humanitarian service? William said, Yes, may be UN and humanitarian service. I watched the interview ones, about seven to eight years ago. I recall that is how the conversation went. The quotes of who asked what and the exact responses are something to that effect. I strongly agree with you it has its deep causes in relation to giving a timely service in times of accident, danger and catastrophe. It is a high risk career in many ways while he has other options, but seems to give him great fulfillment. I thought it was quite interesting and a bit of fun to see what a forensic artist thought Princess Charlotte might look like at age 10, have a look at this link http://wp.me/p4b4TL-as1 or http://www.royal-fans.com/royal-fans-are-already-been-given-a-glimpse-at-what-she-could-look-like-aged-10/ He is saying that from his experience he thinks Charlotte has inherited much of Kate's features, whereas George has more of William's. I looked at one, & it was the same one that had been used when the Duchess’ was pregnant with George. Princess Charlotte will be stunning. I wasn’t thrilled with the pic. Since it will be relatively quiet the next month, I was wondering if you have any information on the Duchess's skin care and beauty regime? Would love a "Kate loves" post on it! Yes, thank you so much, dear Charlotte for your posts. I read that the little princess has her mother’s olive skin. the Duchess used Rose Oil, Bee Venon. Both are available for rather inexpensive prices. Of course, she is a natural beauty. I particularly like the "orf to the country"--sounds like Cockney or something!